How Travel Changed Me Who Am I? I recently started wondering how much language audio lessons reflect the culture of that language. I’m not an accomplished linguist, but whenever I travel, I do like to learn a few words of the local language to help smooth my way. Although I’ve always been told that “please,” “thank you,” and “Where’s the bathroom?” are the most important phrases to learn, I disagree. Please and thank you, of course, are always good to know. But saying “Toilette?” in an inquiring tone will reliably get you directions in every country in which I’ve been, without stumbling over a hard-to-remember phrase like “Hol van a fürdőszoba?” in a moment of desperation. 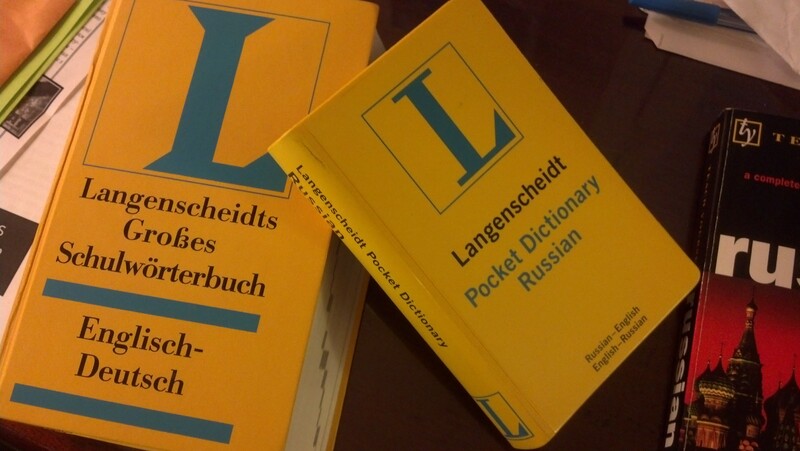 A couple of random foreign language dictionaries…not the source of the language lessons that made me wonder about cultural influence. And I’ve found that learning “Excuse me” is very useful for all those clumsy tourist moments when you do something you’re not supposed to be doing and a local looks at you in disbelief. Or when you’re desperately trying to dash through a crowded station so you don’t miss your train. The other phrase I’ve found very useful is “I don’t understand.” When you ask a simple question using your new language skills and the answer is more complex than you expected or when someone wants to sell you something, “I don’t understand” are the magic words that get you off the hook. Which brings me back to the point of this post. It’s been a long time since I studied beginning German, but my memories of early German lessons were all dialogues like, “Hello, how are you?” “I am well, thank you. And you?” “How much is that?” “It costs 5 Marks.” (I learned German before the Euro.) All useful, practical phrases to get to know people, do your grocery shopping, etc. (Although I do remember my friend Kathy and I driving through the German countryside and howling with laughter because the language tape was teaching us to negotiate the price of a kumquat.) Still, this introduction to the German language seems a good reflection of German culture and people—practical and down to earth. Last year, I went to Greece. The Greek language audio lessons I learned from were full of phrases like “Would you like something to eat? How about something to drink? Shall we meet for dinner at my place or at the restaurant?” Although I felt a little like they were preparing me to pick up Greek men, the focus on being social and gathering around the table to share a meal is very, very Greek. I recently decided to start practicing Russian again and pulled out some CDs I’d used previously. The first several lessons had me repeating “Do you understand Russian? Yes, I understand a little Russian. You understand Russian very well.” Very occasionally, they threw in the phrase, “I don’t understand Russian,” which would have been the most useful since it’s the truth. My face lit up, I’d listened to that phrase in the car that morning. Just as I was about to say “Da! Ya nemnogo ponimayu russkiy”(Yes! I speak a little Russian), I realized that I would have nothing else to say after that. I didn’t speak a little Russian. I spoke no Russian at all other than that phrase. I question the usefulness of your first phrase in a new language being the claim that you already speak that language—when nothing could be further from the truth. As I listen to all the lies currently coming out of Russia about their invasion of Ukraine and as I listen to these language CDs teaching me to say something that clearly isn’t true, it made me wonder—why do Russian language lessons start out by teaching you to lie?